FUJI Sports is one of our sponsors and has provided us with a great deal. Our fans can get this great offer by using our Fuji Sports Coupon. When you use one of our promo codes you are directly supporting our podcast and site. Thanks for your support. FUJI Sports produces only the highest quality products at the best possible prices with the careful eye and passion of two leaders in the industry: Lia Hatashita and Jimmy Pedro. Jimmy, a 4-time Olympian, 2 x Olympic Medalist, World Judo Champion and most recently coach to Olympians including gold medalist, Kayla Harrison, brings an astounding amount of knowledge to the company and wants only the best for athletes, and anyone who commits themselves to learning a martial art. FUJI Sports offers different BJJ Gi’s based on your needs. The All Around BJJ Gi is perfect for training our competition. The Lightweight BJJ Gi is good for hot weather training and making weight at competitions. The Suparaito BJJ Gi is designed for the serious competitor. The Sekai BJJ Gi is designed for serious performance and as a tribute to the world of BJJ. The Nippon BJJ Gi is the new standard in BJJ Gi quality made from the highest grade cotton in the world. The Isami Sachiko BJJ Gi allows for full mobility during fight and practice and is not stiff like some uniforms. They also make, Women’s BJJ Gi’s, Children’s BJJ Gi’s, and Team Gi’s. FUJI Sports also has a good selection of MMA Gear to choose from. The list includes, protective gear, shorts, spats, rashguards, compression wear, apparel, bags, accessories, mats and pads. FUJI Sports is also the official MMA glove of the World Series of Fighting. Fuji Sports also makes Judo Gi’s and Karate Gi’s. 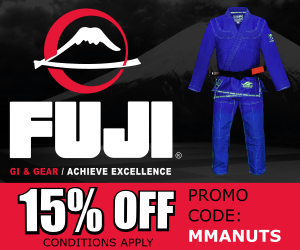 The FUJI Sports Coupon Code MMANUTS for 15% Off, cannot be paired with other sales and cannot be applied to custom Team Gear, FUJI Mats, or the Nippon Series gi. Free shipping is not provided when paired with this FUJI Sports promo code.